With the markets not doing much today, I’ve spent some time making some changes to the various sub-categories of trade ideas. With a lot of rapid sector rotation taking place under the hood lately while the broad markets trading today right around or below where they were at the first day of the month, that sideways trading action has made the near-term technical outlook a bit obscure lately which has led to more “unofficial” trade ideas being posted than usual. Unofficial trade ideas are those in which I don’t have a level of confidence high enough to add those trades as official trade ideas yet I believe that the technical developments in the charts are worth sharing for those that might be interested in some additional trade ideas or just looking for some analysis on a particular stock or sector. With the flurry of unofficial trade ideas lately, such as all of the stocks covered in the recent shipping sector & cannabis sector videos, I realized that the lists of ticker symbols under the Long & Short Trade Setups were getting quite cluttered with too many ticker symbols, without a quick visual reference to determine which trades listed under those categories were official & which where unofficial ideas. As such, I’ve created a new parent category of Unofficial Trade ideas with two sub-categories: Long Trade ideas & Short Trade ideas. The new Unofficial Trade ideas are now located at the far right end of the drop-down menu which appears under the Trade Ideas option on the main menu bar located at the top of the site. Please note that the ticker symbol tag cloud (columns & rows of ticker symbols that link to the associated posts) don’t yet appear above those new unofficial trade categories but will as soon as the necessary programming is completed. While going through the trade setups to re-assign the unofficial trade ideas to their new categories, I had notice a couple of trades that had exceeded their suggested stops & should have been removed from the Active Trade category earlier. The first is the LNG short trade from last month. 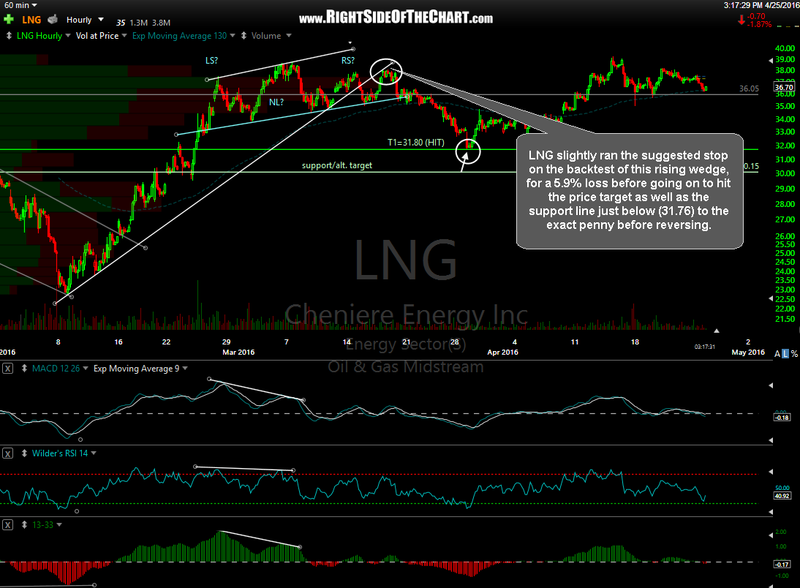 After triggered an entry, LNG slightly crossed above the suggested stop on the backtest of this rising wedge, for a 5.9% loss before going on to hit the price target as well as the support line just below (31.76) to the exact penny before reversing… a case of a stop being set just a hair too tight with a trade that would have went on to hit the final target in relatively short order. LNG has now been moved the Completed Trades category to be archived for future reference. FCX has also exceeded the suggested stop & will be updated under a separate post assigned to the FCX symbol tag for categorization/archiving purposes.